One of the odd obsessions that has occupied me for the last decade is Mazu, the Chinese marine goddess, patron deity of all those in peril on the sea. She began life as a real person, Lin Moniang, a quiet, contemplative Song dynasty girl who used to legendarily stand on Fujian clifftops in thunderstorms, wearing a bright red dress to serve as a human lighthouse to her father and brothers in their fishing boats. Lin Moniang, so the story goes, walked into the sea, sacrificing herself so that her father’s ship could return safely, becoming in the process a personification of the sea itself. Deified by later emperors, her red-clad image can be found everywhere Chinese sailors drop anchor. 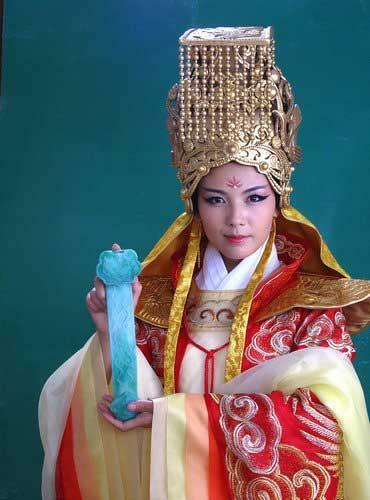 There are statues to Mazu in China and Malaysia, and two temples to her in San Francisco’s Chinatown. Her most famous devotee was Coxinga, the pirate king of Taiwan, whose life is bracketed by portents of her favour and blessing, and whose island enclave was conquered a generation later by a one-eyed admiral who claimed to see Mazu with his blind eye, standing waist deep in the waters of the Taiwan Strait, and fighting for the Manchus. In 2010, I stood in the shadow of a massive statue of Mazu in Tainan, as a lone monk chanted an endless sutra, and a replica of Coxinga’s ship was launched from the dockside. In 2009, I climbed a hill in Nagasaki to the temple maintained by Coxinga’s Japanese relatives, where a squat statue of Mazu glowered in the central hall. I keep meaning to write something, when I get the chance, about the Mazu cartoon film, as yet unavailable in English. But I’ve been prompted to mention her today because of the series on Chinese television at the moment, which dives headfirst into Mazu mythology with flying demons, heated debates among the immortals, and sea devils rising from the Taiwan Strait. Oh, to be a commissioning editor at the BBC with a mind to recreate the Monkey madness of years gone by… because Mazu is the series that might just do it.